Puyo Puyo 7 not only marks another change in the setting of the series, but also marks a change in how story-focused the series becomes. Whereas this would normally be a cause for concern with other games, Puyo Puyo 7 sets the tone for future releases by easily maintaining the lighthearted and humorous antics of the previous games with a few new main characters. 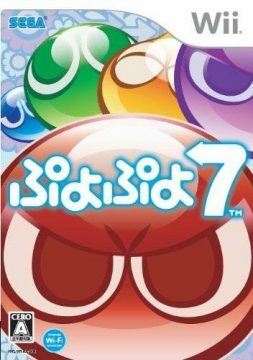 Add to this its completely new mechanic, and Puyo Puyo 7 easily sets itself up as a highly entertaining addition to the series. The game’s story mode is easily its biggest change. 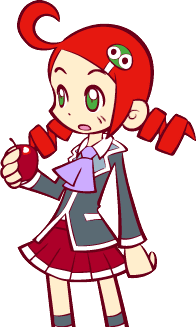 Whereas previous Sega-based games in the series give you the ability to play as a few characters and experience the story through their eyes, in this game you’re only given the option of playing as one character: a new girl named Ringo Andou. She isn’t the only new character, however; a few characters of the cast are new to accommodate for the change in setting. The protagonist of the game, she’s a regular schoolgirl until things take a turn for the not-so-regular. She plays the straight man to a lot of events that go on in the story, complete with overexaggarated portraits. Her name means apple, and many of her chain quotes focus on math terms. Ringo’s childhood friend, and the oldest son of a fishmongerer – in fact, his name means tuna. 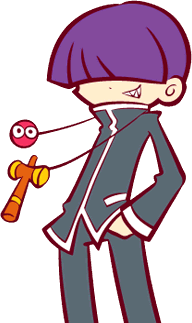 He carries around a kendama, which his chain animations focus on. A lot of his sentences end with a star for some reason. A classmate of Ringo and Maguro. For some reason, he’s obsessed with love – many of his chain quotes focus on such, as a matter of fact. Risu means squirrel and kuma means bear, so his name is a play on his appearance. 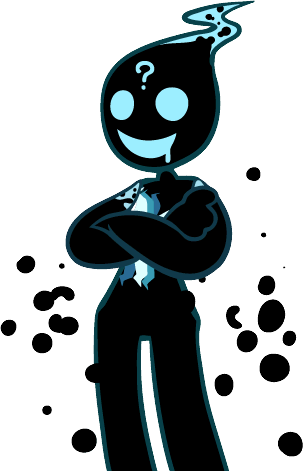 The antagonist of the game, it is a being that can travel space-time at will. It has a desire for fun, though its definition of fun is quite dangerous. It has the power of possession and imitation – as a matter of fact, it possesses Arle to set the events of the game in motion, and imitates others in its chain animations. Whereas previous games in the series had you select courses of with a small number differing stages and different characters on top of that, since there’s only one main character here, things progress a bit differently. Instead of having selectable courses, story mode progresses through one continued story, divided into six acts with stages in each. Each stage has its own rule of battle for the match within, given to you before you select it. 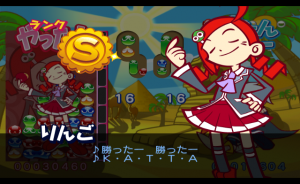 Much like Puyo Puyo 15th Anniversary you’re given a rank after every stage, and the average of your rank is given after you clear each act (though this ranking is only shown in the options menu). Finally, although Ringo is initially the only character you’re allowed to play as initially through the story mode, you’re able to go back to certain stages and play as other characters once you’ve fully finished the mode. Unfortunately, you’re not able to play as absolutely everyone, and there’s not much incentive for doing this other than witnessing more of the charming dialogue the game has to offer. Still, it’s a small, yet nice touch to encourage replaying the story mode. The plot this time around is a bit more detailed than the previous games. 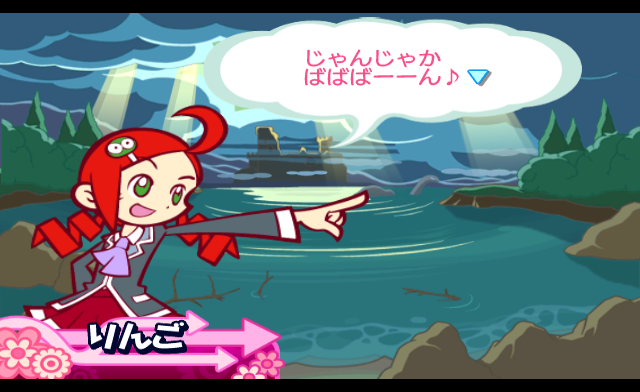 Ringo’s school begins to be flooded by puyo, and she must find a way to stop the endless assault of puyo from flooding her world. 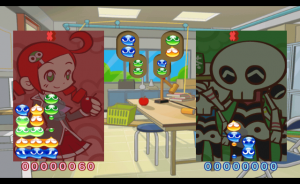 Along the way, she meets many characters from the previous titles – even a few Compile-era characters (Schezo, Rulue, Satan, Arle and Carbuncle, Draco, and Skeleton T) make their appearance once more as playable characters. Witch and Harpy even show up, though they are unfortunately only cameo appearances and not playable. 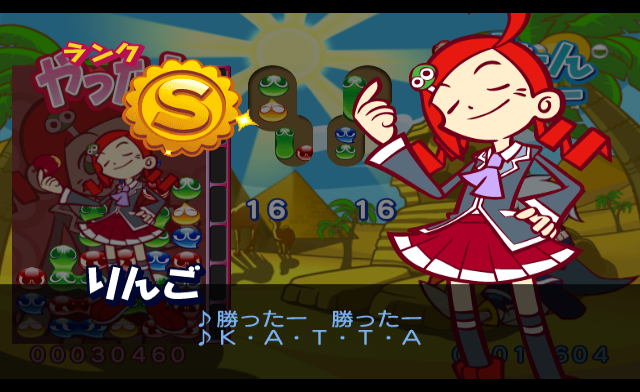 Puyo Puyo 7 doesn’t just bring a redesigned story mode to the table; it also brings a new mode, labeled Transformation mode. 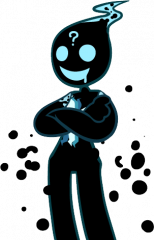 In this mode, your character is able to transform into either an adult or child version of themselves, a process achieved much like Fever mode. By offsetting, you fill up a gauge on the side of the screen, and by filling up all seven portions of it, you transform. Both adult and child form have their own differing mechanics; adult form is much like the Giant Puyo mode of Puyo Puyo 15th Anniversary, in that you have a 3×6 field with larger than average puyo and only have to form three puyo together to make a chain. 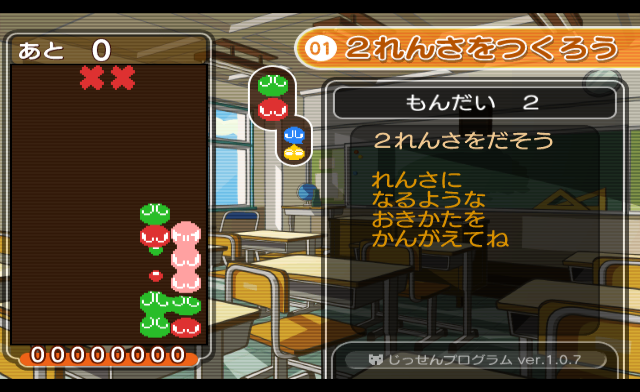 Child mode itself is also much like Fever mode, just smaller; with a 10×18 field and smaller puyo, your goal is to start the predetermined chains given to you in a correct manner. Both modes sport weaker chain power than normal, but this is because the magnitude of your chains carries over between transformation sessions. In child form, keeping your chain power is easy enough since it’s set exactly like Fever, but this is a bit more difficult for adult form since your chain magnitude can flat out disappear if you take too long between chains. 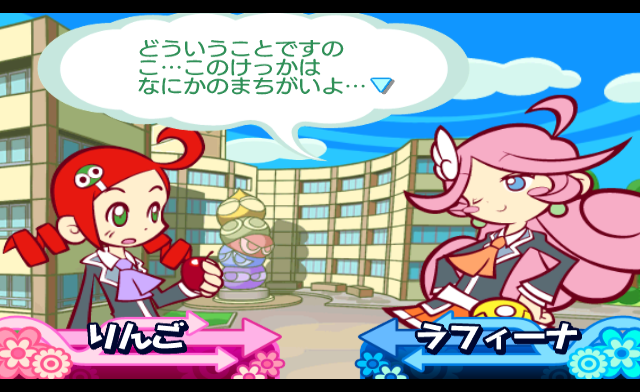 This puts a bit more of an emphasis on transforming during a normal match, and something that stresses this is the fact that you’re also able to fill up the transformation gauge by clearing nuisance puyo on your side of the screen. This allows you to more freely dictate and plan out when you’d like to transform. Whether you transform into a child or an adult is dictated through a selectable option before the match starts – you’re also able to set it so that which mode you transform into is dependent on what color puyo you clear last, but this is more trouble than it’s worth since you have to juggle between two forms which splits your offensive power considerably. Finally, you’re able to instantly drop your puyo by pressing up, a first for the series. As you’d imagine, these mechanics make the mode quite daunting. The magnitude of your chains as well as the extra time you can accumulate before entering said mode caps off at 99, so regular gameplay with friends can unfortunately seem like a race to see who can get more of a lead in their transformation states. What adds to this is that, unlike Fever, no nuisance puyo drop down upon you while you’re transformed, so there’s no hope of interrupting your opponent while they’re focusing on chains. Consequently, this mostly eliminates the chance for a comeback unless you transform as well due to how much power you get during it. 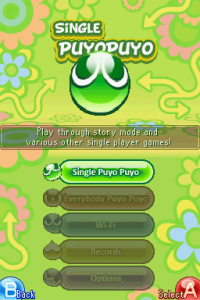 Aside from the story mode, the endless and multiplayer modes from the previous game are available in Puyo Puyo 7 – there are also endless modes of both adult and child modes, keeping in with the new feature. The lesson mode from Puyo Puyo 15th Anniversary also makes a return appearance, though it’s been formatted a bit differently. Instead of showing you the three basic forms of chains like the previous lesson mode did, Puyo Puyo 7 opts for a bit of a more complete approach in regards to the fundamentals of the game. Not only are the rules of each game mode explained here in more detail, but you’re also taught the very basics of chaining before getting on to the type of chain patterns used in competitive play. 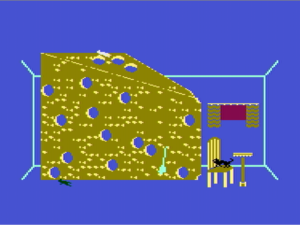 There’s also a section that shows you how to fuse the stairs and sandwich pattern, which is a great move since visualization is key when working with new types of chains. A further step to ease new players in has also been taken through the practice questions given after every lesson. In Puyo Puyo 15th Anniversary’s lesson mode, Ms. Accord and Popoi would offer slight quips here and there as you completed the practice – although they were entertaining, they didn’t help you focus much. In this game, however, things are much more helpful; you’re always given a tip that gives you a general idea of how to progress. 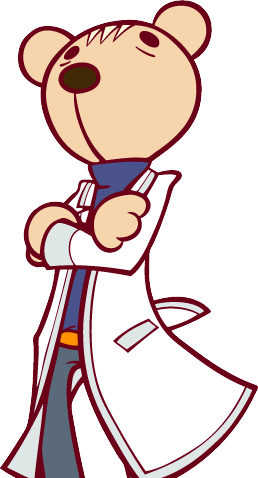 What’s more, certain multi-step practice stages give you a new hint every time you drop your puyo down, which can help tremendously. 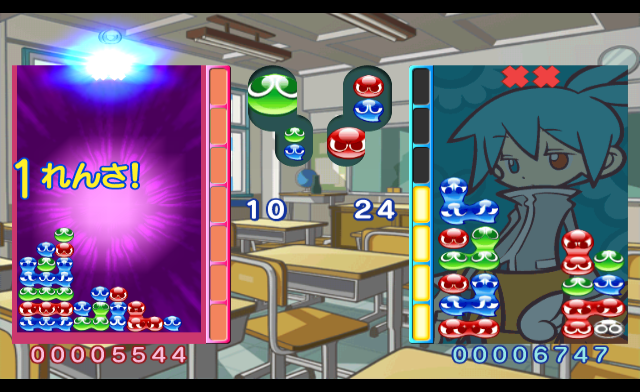 Although the sets of 100 drills for each pattern are gone, Puyo Puyo 7 makes up for it through a tool that allows you to build your own board of puyo from scratch. Although this isn’t entirely new for the series – earlier games such as Super Nazo Puyo: Rulue no Roux had this, for example – there are a few new additions. The most important one is a password system, which finally allows you to share boards you’ve created with friends in a relatively simple manner. 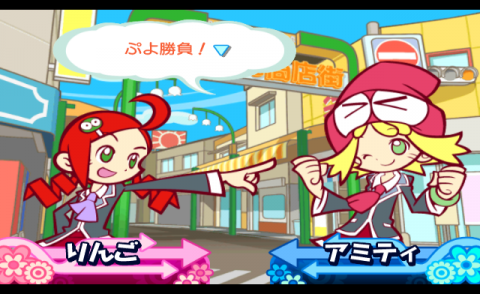 The other additions are mainly for curiosity’s sake: you’re able to adjust the board’s size to fit the dimensions of the adult and child transformations, able to change what character is behind the popping of the puyo to see their differences in power and voices, able to set the power and score of chains to Puyo Puyo Tsu’s or the later Sega games, and also able to change whether the mode is in fever or not. Finally, there’s an option to view up to four pre-made patterns of chains with a magnitude of up to 19, all different depending on what step you wish to view. Altogether, this makes for a very comprehensive tool to use for training, one that shouldn’t be overlooked if you want to get better. 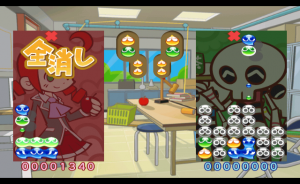 Overall, Puyo Puyo 7 is a game that shouldn’t be passed up. Not only does it tell an interesting and humorous story, but the changes to the lesson mode make it so that both experienced and beginning players can get the most out of what the game has to offer. Although much isn’t made to change the core experience, and the main gimmick can be a bit overwhelming, it’s still a game that’s worth checking out. English translation – A translation of the DS version, courtesy of Puyo Nexus.